Staff are friendly and welcoming, location of the hotel is very good. Central at start of Alanya beach, right next to front main road, stacks of amenities beaches galore in front of Hotel,walkable distance to marina, staff amazing friendly and helpful, greeted every morning with smiles and good wishes, hotel rooms fab with huge balconies, hotel lift for 4 persons, stayed room 305 it was cornered view into sea and front main road and restaurants, air con in rooms, double fridge freezer 2 wardrobes, pink bathroom walk in shower even shower shoes were left for use, staff are family run hotel they were a delight we will go back defiantly. Friendly & helpful staffs & management. Excellent location for beach or all places of interest to visit. Great free WIFI connection in all rooms. Planned redecoration and further improvement on the property to carry out for the new season. Exellent, friendly stuff, ready to help in all matters. Quite big app. 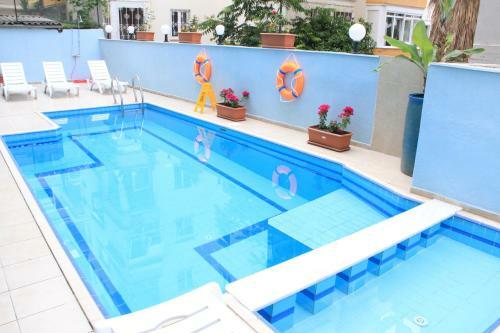 Very good location, everything near (beach, city centrum, restaurants, shopping). Nice, refreshing pool on the property. Väldigt hjälpsamma personal som välkomnade alltid med ett trevligt leende och hjälpte allt från adress till boka transfer till flygplatsen och andra ställen utan kostnad. Strand och strandpromenaden är bara på andra sidan gatan. Migros affären (motsvarande Ica), restauranger och klädaffärer ligger väldigt nära. Personalet og beliggenheden af hotellet var super fint. Jeg betalte for 1 lejlighed og kunne indkvartere 3 personer til samme pris. I de første dagene var frokosten en skuffelse, men da vi ble vant til den gikk det bra. Vi forestillte oss et samlingsrom med bufet, men fikk et fat med egg, syltety, tomat, agurk smør, te og kake. Det var etterhvert ok. Vi kan ikke vente så mye mer til prisen pr. Dag. Душевный персонал! Очень чистый номер, белоснежное постельное белье. Расположение очень удобное. Рядом - всё! И остановки и море и магазины. До центра 15 минут пешком, либо на автобусах 1 и 101 буквально 3 остановки (проезд 3 лиры). До пляжа Клеопатры чуть дольше - остановок 6 (либо пешком вдоль кафе, ресторанов, магазинов). Мы не первый раз в Алании, поэтому проблем с транспортом не было. Если из отеля выйти и повернуть на право, то через 3-5 минут вы дойдете до остановки автобусов 2, 202 - которые отвезут вас в ТЦ Аланиум, а если сесть на автобус 10, то он привезет вас в Дим Чай. 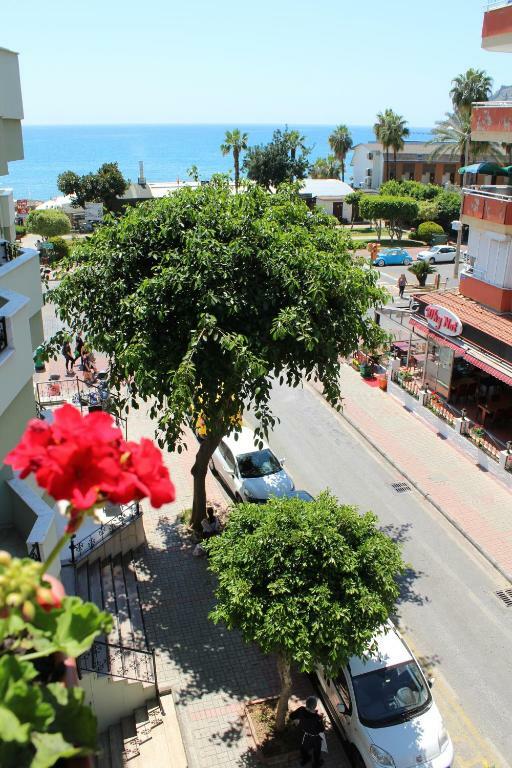 Lock in a great price for Deniz Apart Otel – rated 8.1 by recent guests! 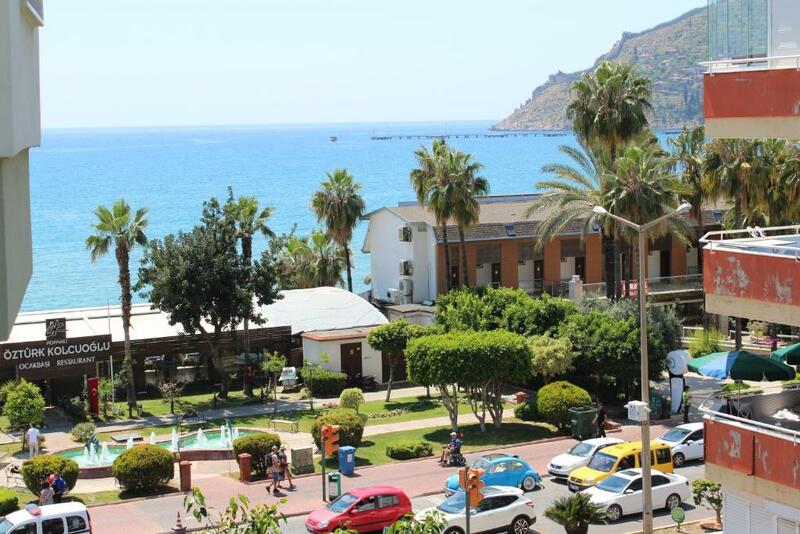 One of our top picks in Alanya.Deniz Apart Hotel is located in Alanya, very close to the beach and city center. Beach is nearly 30 feet and city center is 350 feet from us. Totally we have 15 one-bedroom apartments. İn all apartments we have bedroom and livingroom with kitchen. 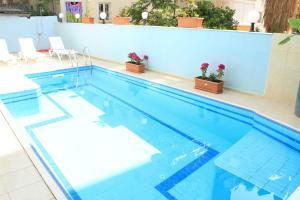 İn bedrooms one double bed or two single beds depending on your request. Large and fresh balconies will add your holiday extra charming. Restaurants, cafes, bus stop, taxi station, markets and super markets are in a walking distance from the hotel( 5-30 feet). İf you need something you can reach us 24 hours a day. When would you like to stay at Deniz Apart Otel? 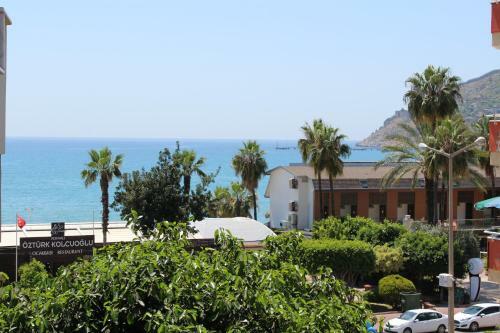 'DENİZ APART HOTEL' denize10m mesafede olup şehir merkezine 400m yürüyüş mesafesindedir.Alanya kalesine ise sadece 950m yürüyüş mesafesindedir. Bütün eylence mekanlarına yakınlığı,otobüs ve taksi duraklarına ise 20 m mesafede olması size şeherin diger güzel yerlerine görmenizi kolaylaştırıyor. 'DENİZ APART OTEL' 15 (1+1) dairesi olan cok nezih bir apart oteldir.Odalarda misafirlerimizin güzel bir tatil keçirmesi için her türlü şerait mevcuttur. Bulunduğumuz semt Alanyanın turizim icin kurulan en gözel semtidir. Semtimiz denize, şehir merkezine,eğlence mekanlarına yakınlığı ile mehşurdur. House Rules Deniz Apart Otel takes special requests – add in the next step! Deniz Apart Otel accepts these cards and reserves the right to temporarily hold an amount prior to arrival. 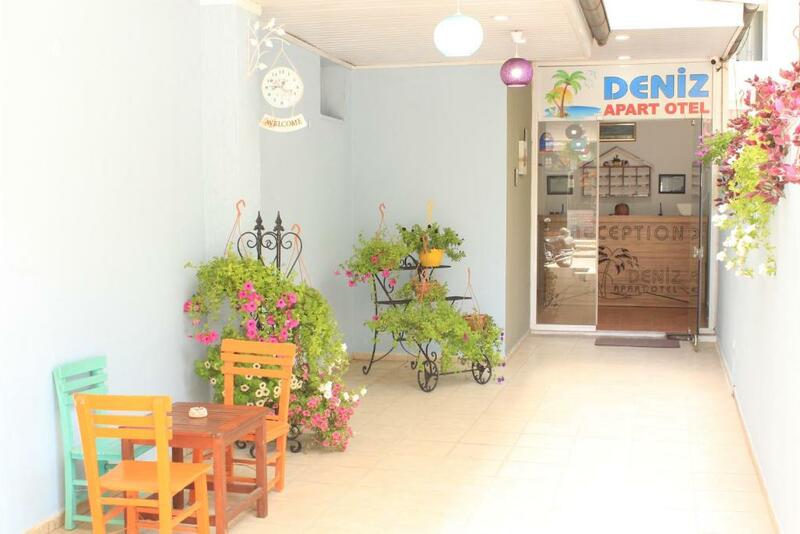 Please inform Deniz Apart Otel of your expected arrival time in advance. You can use the Special Requests box when booking, or contact the property directly using the contact details in your confirmation. The toilet was old and needs renovation, view of the room was not as expected. The policy of changing towels and sheets is not good. lighting of the hotel and room are not enough. Dark corridor needs better lighting. Not enough electric point in room. Out dated furnishing. Old facilities, almost no kitchen euipment so no possible to prepare meals. App urgently needs a renovation, some additional furniture, bigger dining table, maybe some chairs on the balcony would be nice. Good dinners Spacious rooms. Friendly staff. This is an absolutely dirty place no matter where you look everything is dirty or broken. After walking for 5 Minutes barefeet my feet were completely dark, the toilet was smelling like a public restroom, there was mould in the fridge and so on. We lost a lot of money because they already took our money before our arrival and didn't want to give it back to us the next morning when we decided to leave this place. I didnt even want to spent one night at this place. So we took the first bus in the morning back to antalya what also costs money again. In order to that my boyfriend got sick because of the stress they caused us so they really took us a lot of time of our holiday.. After spending a few hours in that place I can't understand how anyone could recommend this place in a positive way... Doesn't seem real to me. By the way we also uploaded pictures of this place in trip advisor but "somehow" they got deleted... Just Don't make the same mistake as we Did and look for something else!!! Horrible hotel!!! In fact not hotel! They dont have clean service! We asked they said we are apart! Then why u name it deniz apart otel??? They ruined my holiday! Everything is broked. No air conditioner in the living room. First day, we enter our room, tv dont work, they changed our room, we enter the second one refrigerator dont work, they changed it also.. and they dont give towel, only every 3 days they change it! of off u should close this hotel or motel u should name it!